Whole leaves retain the full components and essential oils of the tea plant (Camillia sinensis). Consumers are realizing the superior health benefits of whole leaf tea and are increasingly adding a "warm cup of tea" to their daily regimen. Whole leaf teas are at the heart of sustainable, organic tea growing furthering practices that protect soil from erosion, water supplies from contamination and field workers from chemical exposure. 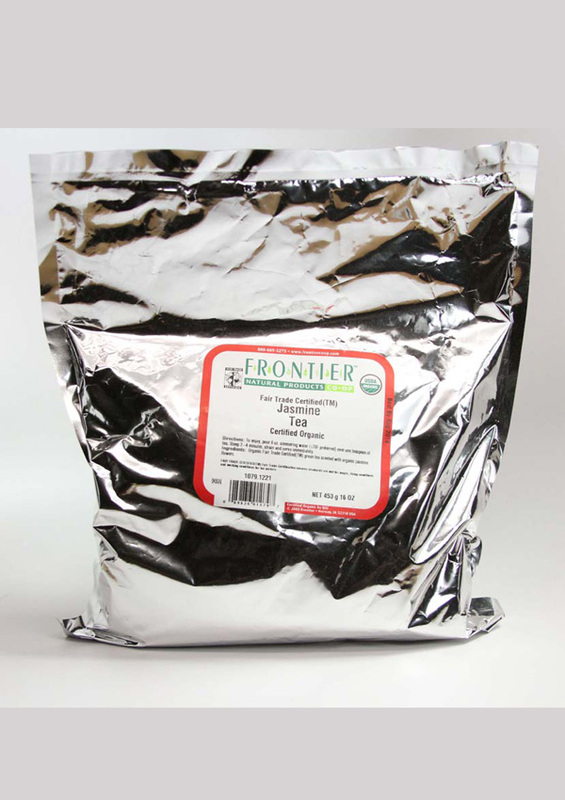 Strong, established relationships with organic tea growers allows Frontier to offer the highest and most diverse selection of premium, organic and Fair Trade whole leaf teas. To enjoy, pour 6 oz. simmering water (170 degree F preferred) over one teaspoon of tea. Steep 2-4 minutes, strain and serve immediately. Ingredients: Green tea scented with jasmine flowers.